Black Magic Snapper Snatcher flasher rigs have landed some serious fish over the years, and it’s not by luck. Australian anglers continue to swear by their quality, and constantly send Black Magic great fish photos and feedback. Now the range has been further improved with the exciting new super lumo colour. This new rig is tied with the popular KL recurve hooks and Tough Trace, but what makes it stand out is the ‘flash’ colour, Super Lumo. The rigs tied with this material out-performed many other products during field testing, and this is due to their high luminosity and UV content. And you can also ‘super charge’ them with a Black Magic UV Torch. 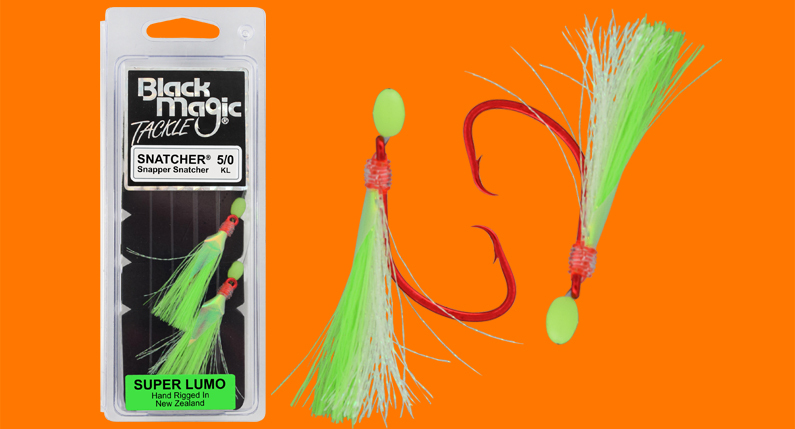 Snapper Snatcher super lumo rigs are available in sizes 5/0, 6/0 and 8/0. For more information visit the Black Magic website, or look them up on Facebook for all the latest catch photos, news and competitions.